Temperatures in Vermont can frequently dip below zero. And while our summers are short, they are often hot and humid. Grape varieties grown in our climate must be disease resistant and hardy enough to withstand such extremes of cold and humidity. Most of the grapes we now grow here in VT are the result of pioneering hybridization work done by a mid-western farmer named Elmer Swenson, and subsequently by the University of MN, which cross-pollinated cold hardy native grapes with fine European vinifera. This Pinot Noir hybrid developed by the University of Minnesota is super cold hardy and disease resistant while producing outstanding quality red wines with complex notes of cherry, berry, pepper and spice. A recent hybrid developed at the University of Minnesota has excellent winter hardiness and produces white wines with distinct apricot, citrus and peach aromas and flavors. Wines can be made off-dry or sweet. An Elmer Swenson hybrid. This white wine grape produces wine with a delicate floral nose and is best used as a blending component to add body to a thinner wine. Considered one of the “Noble” grape varieties, this traditional cool climate European grape (vitis Vinifera) produces a wonderfully aromatic crisp white wine with bright acidity and notes of peach and honeysuckle in our vineyard. A very new Minnesota hybrid red wine grape with excellent cold hardiness and disease resistance. Produces complex wines with soft tannins and low acidity. This cold hardy hybrid, developed by Elmer Swenson is well suited to our climate. It produces red wine with berry, tobacco and spice characteristics and is used primarily for blending. An Elmer Swenson hybrid (and named after his wife), this varietal makes white wines light in body with a moderate acidity and delicate aromas of flowers and honey. Well suited for blending. 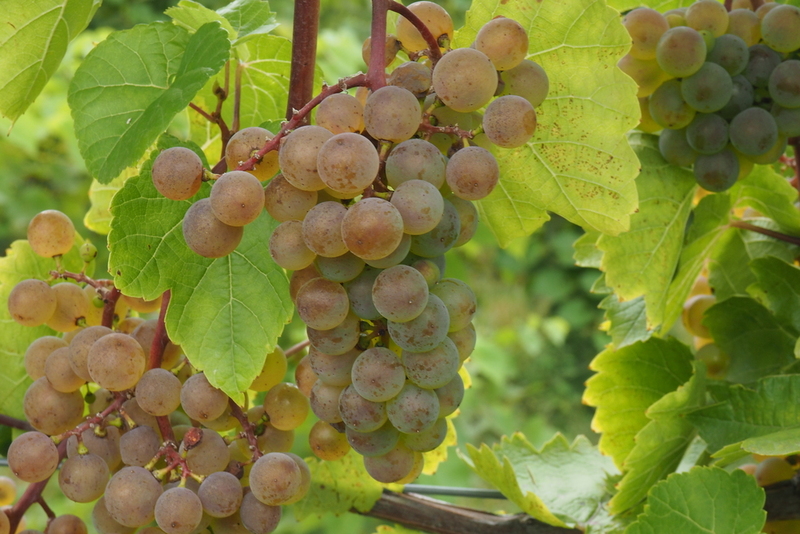 A hardy French American hybrid white wine grape. Requires a long season to produce sugars needed for dessert wines. Produced from the Vitis vinifera variety, Raydon d'Or (Seibel 4986), it is a very winter-hardy variety that manages to produce high sugar levels in cold climates with moderate to high acidity.